AFSA Open House. On Thursday, May 3, AFSA will be open from 11:00 a.m. to 5:00 p.m. We welcome you to come by for refreshments, meet with staff, learn about the work we’re doing and resources we have available, and possibly run into old friends. We will also have a professional photographer on-hand to take free head shots that we will provide to you for use on social media, bios, etc. We’re just two blocks from Main State so plan to come by. We’ll be here. 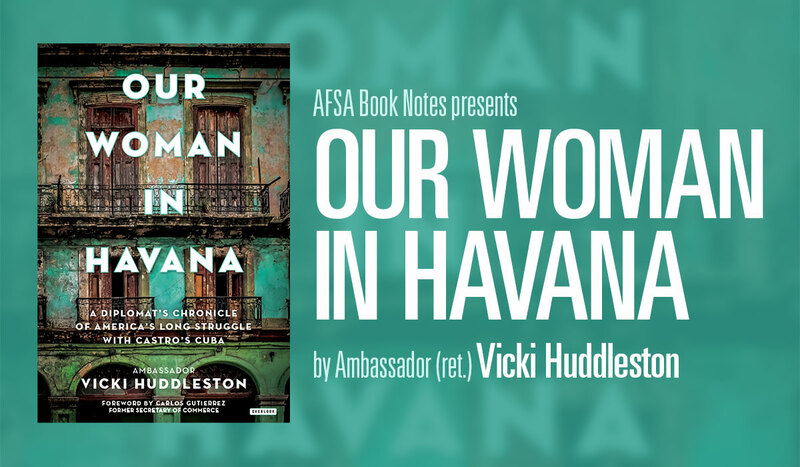 AFSA Book Notes: Our Woman in Havana by Ambassador (ret.) Vicki Huddleston. Join us from 12:00-1:30 p.m. as Amb. Huddleston discusses her new book and her vast experience with Cuba. Books will be available for sale. This event is filled to capacity. AFSA will record the session and make it available for online viewing. Designing the Perfect Bio. Join us from 2:00-2:30 p.m. on May 3 as career coach Janeen Shaffer talks members through how to craft a professional bio. This event is filled to capacity. AFSA will record the session and offer additional iterations of the program in the near future. Advocating for the Foreign Service in Your Community. Retired members of the Foreign Service have been critical in efforts to tell the story of the Foreign Service and highlight the importance of diplomacy and development. On Thursday, May 3 at 3:00 p.m. we invite you to join us for a session at AFSA headquarters, 2101 E St NW, on how to be effective advocates for the Foreign Service in your community. Attendance is limited; click here to register. Fewer than 20 spots remain. Memorial Ceremony. 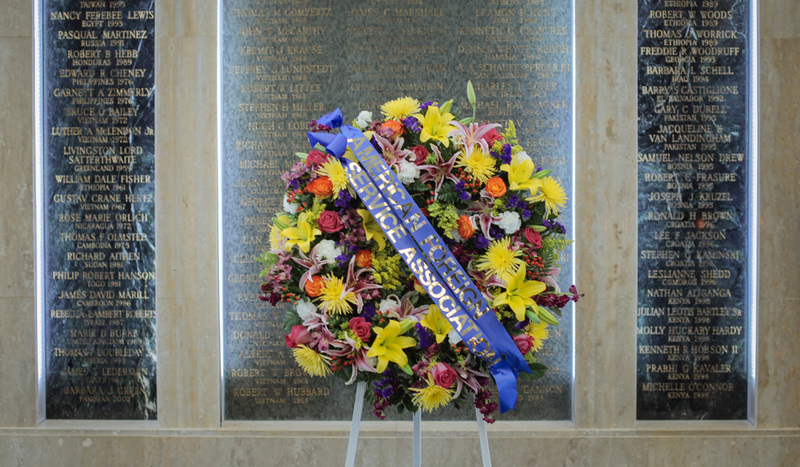 On Friday, May 4 AFSA will commemorate fallen colleagues during our annual memorial ceremony held in the C Street Lobby from 4:15-4:45 pm. For those participating in Foreign Service Day activities, the ceremony will be broadcast in the Dean Acheson Auditorium. AFSA Reception. As in previous years, we invite you to a reception at AFSA, Friday, May 4 from 5:00–6:30 pm. We will have light hors d’oeuvres, beer, wine, and soft drinks. This is a good chance to re-connect with friends and colleagues as well as hear the latest update from AFSA President Ambassador Barbara Stephenson. Click here to register. Finally, for the third year in a row AFSA is promoting a coordinated Letters to the Editor campaign in support of the Foreign Service. AFSA has provided templates and messaging that you can include in a letter to your local paper. The most important thing is that local papers hear from their readers about why a strong professional Foreign Service is critical to sustaining U.S. global leadership. Once a Foreign Service member becomes eligible for retirement, there are options to be weighed. Most people find that personal factors are more important than financial factors when deciding when to retire. But, please keep in mind that, for each year of employment forgone by retiring before required, you forfeit the following: a year’s full salary, a year of service credit added to your retirement benefit calculation, a year of continuing to build up your TSP balance, the 5 percent of salary that the government deposits into the TSP accounts of “new” retirement system employees, use of the Flexible Spending Account (not available to retirees), and paying your FEHB premiums with pre-tax dollars (not available to retirees). If you ever need retiree-related assistance from AFSA, AFSA’s Retiree Outreach Coordinator Christine Miele can be reached at miele@afsa.org and (202) 944-5517. AFSA’s Member Accounts Specialist Ashley Dunn is available at dunn@afsa.org or (202) 338-4045. AFSA Retiree Vice President John Naland can be reached at naland@afsa.org. In March, Congress passed the federal budget without adopting cuts to retirement benefits. But, still on the table is the President’s FY19 Budget Request which includes proposals to require employees to pay more into their pension trust funds, calculate pensions based on five years’ salary instead of three, and eliminate the annuity supplement for retirees under age 62. These proposals do not appear to be gaining traction on Capitol Hill, but AFSA remains vigilant. AFSA will continue to oppose benefits cuts in coordination with the Federal-Postal Coalition made up of 30 organizations including the National Active and Retired Federal Employees Association (NARFE), the Senior Executives Association, and the large civil service unions. The Fed-Postal Coalition represents 2.7 million federal employees and 2.6 million federal retirees. If a loved one has experienced a long term care event, you’ve probably seen how paying for assistance with the most basic daily activities, such as bathing and dressing, can impact savings and assets. Maybe you’ve also witnessed the sacrifices of time, energy, and money that friends and family members have been asked to make when a loved one develops a cognitive impairment such as Alzheimer's disease. As a result, you may be wondering what you can do to avoid these financial and emotional consequences should you ever need long term care. 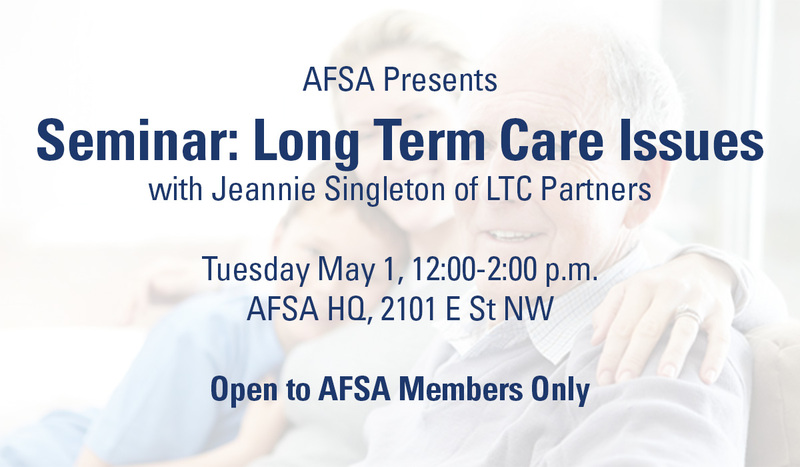 Join Jeannie Singleton of Long Term Care Partners (which runs the federal program) to review the impacts of long term care and learn how the Federal Long Term Care Insurance Program can help protect your financial plan in retirement. The presentation will be at 12 noon on May 1 at AFSA headquarters. Click here to register; this program is open to AFSA members only. A video of the session will be posted online afterward. On March 22, AFSA hosted a webinar for our retiree members on “Reviewing Your Retirement Plan”. Now available on our website at www.afsa.org/video, this helpful presentation, led by former director of the Department of State’s Office of Retirement John Naland, discusses specific retirement benefits and the types of life-changes or considerations which might prompt a mid-course correction in your retirement plans. The video also includes a question and answer period where questions submitted from retirees during the webinar are addressed. If you are considering making changes to your retirement plan or believe it's time for a possible tune-up, this video presentation is a great place to start. In an effort to make our programs and presentations accessible to our members living across the country and around the world, AFSA is increasingly using video and webinar technology. Participating in a webinar is easy and most often as straightforward as clicking on a link which will take you to the webinar website and allow you to see and hear the presentation. This technology also allows for participation by having a function where participants can send questions for the presenters. We hope you will consider participating in one of our future webinars. AFSA welcomed 40 new retiree members from the recent Job Search Program (JSP). The latest JSP finished on March 30 with a reception hosted by DACOR and AFSA to celebrate the accomplishments of the attendees—members of the Foreign and Civil Service—as they enter into retirement. AFSA offers a variety of benefits and services to our retiree members; click here to learn more. If you are nearing retirement, please remember that your AFSA membership will not carry over automatically. You must take action to remain a member in retirement. Email us at member@afsa.org and we can help you with that transition. 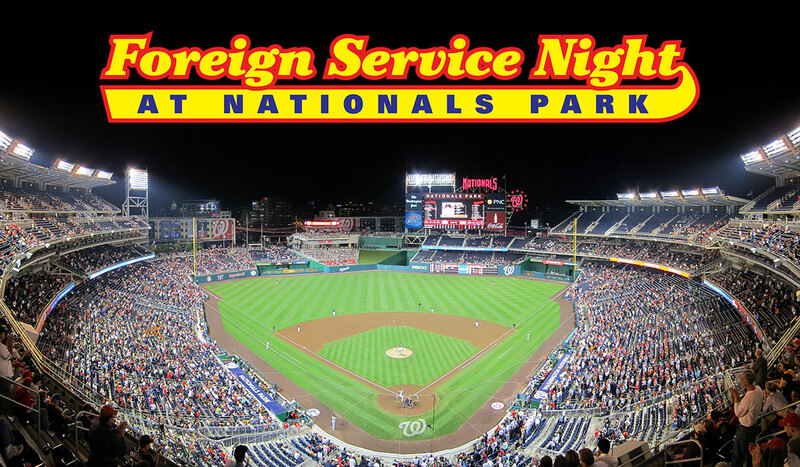 The third annual Foreign Service Night at Nationals Park has been scheduled! Join us on Friday September 7 at 7:05 p.m. as the Nationals take on the Chicago Cubs. Members of the Foreign Service receive specially discounted tickets and concession credits, the Foreign Service will be honored on scoreboard messages, and more! Come enjoy an evening with your friends and colleagues as the Nationals take on the Cubs! Click here to buy a ticket. Sales will be cut off at midnight on Thursday September 6.